Today, there is no talk about food allergies or recipes. Instead, I want to share a story about a little boy who has inspired everyone who knows him and is, in every possible meaning of the word, an absolute miracle. It is the story of the amazing John Birtch – the son of some of our closest friends. John was born November 30, 2005, 16 weeks too early, at only 24 weeks 5 days gestation due to a bulging bag and prolapsed cord from an undiagnosed incompetent cervix in his mom. He only let out a tiny cry before he was handed to a team of Neonatologists and level III Neonatal Intensive Care Unit (NICU) nurses. He weighed in at 1 pound 8 ounces (680 grams)and was about 12 inches long – picture the size of a ruler. Nothing prepared any of us for the roller-coaster that John and his family embarked on on that November day. I remember anxiously awaiting all of the updates that Jill, Jamie, and the family would send out. But, after fighting for his life and overcoming every difficult obstacle possible that a micro-preemie can face, John Birtch amazed every single one of us. On March 20th, 2006, weighing in at 6 lbs 10 ounces, and measuring 18 inches long, he left Phoenix Children’s Hospital after calling that NICU “home” for the first 110 days of his life. Since then, this little miracle has shocked, impressed, amazed, and astounded every one of us. He has accomplished every single milestone that his doctors told his parents he would not ever do. He is a fighter and just never gives up. And although they do not ever really admit it, John’s parents and grandparents have been a HUGE reason for this as well. They have been ultimate crusaders, working tirelessly with him on his therapies and exercises. And, for all of my healthy nutrition-minded readers, John’s mom, Jill, would make every one of you so very proud. Because John has been on a feeding tube, she has blended the most most amazing concoctions for him every single day for the last 5 years – she has packed them full of organic greens, vegetables, fruits, flax and fish oils, raw nuts, vitamins, and more. They are jammed with more nutrients than any of us could ever imagine getting our children to eat occasionally, let alone every single day. His brain has been fed with such nutrient-dense foods over the years that he has absolutely thrived and stayed so incredibly healthy! Another testament to what nutrition can do. If you saw him today, you would never realize, or even believe, the dire prognosis that this little angel was given five years ago. Just watch this montage of his progress over the years. You, too, will probably have a tear stained face and be at a loss of words as you watch the journey of this little guy who was never thought to walk, talk, smile, or even recognize his parents. And, a while ago, John’s mom, Jill, wrote a poem describing her feelings about her roller coaster of emotions that she went through on her blog. With her permission, I am sharing it with you guys here. Get a tissue out first, though. Imagine being told you were pregnant after having a miscarriage the month before. Imagine hearing your baby’s heartbeat for the first time. Imagine being air-vaced to the ER at 24 weeks pregnant , thinking that you have lost your baby. Imagine being told that you are about to have a C-section, but don’t expect your baby to come out crying. Imagine lying on an operating table feeling helpless because there is nothing you can do to help your baby. Imagine your baby being born the size of a ruler, weighing a pound and a half. Imagine your baby being 100% dependent on a machine to live. Imagine your wedding ring fitting on your baby’s arm, loosely. Imagine not being able to hold your baby for weeks. Imagine getting a call from the doctor at 3:30am because your baby has an air leak in his lungs. Imagine looking at your baby , praying to God, that he will live another day. Imagine not being able to breath every time the phone rings. 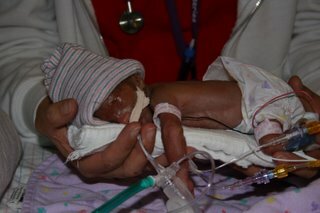 Imagine your baby having life or death surgery when he is only 8 days old. Imagine watching your baby being prepped for surgery, not knowing if you will ever see him alive again. Imagine hearing that your baby has a grade 4 bi-lateral brain bleed and will have long term disabilities. Imagine a doctor encouraging you to take your baby off life support because his quality of life is uncertain. Imagine praying to God that the doctors are wrong. Imagine loving your baby so much that their diagnoses means nothing to you. Imagine crying your self to sleep EVERY night. Imagine having a baby but going home without one. Imagine what it feels like not knowing if your baby’s next breath will be his last. Imagine going to the mall, too afraid to buy baby clothes, because your not sure that your baby will live to wear them. Imagine bringing your baby home, but you can’t take him anywhere because his immune system is too weak. Imagine being woken up by the sound of your baby’s heart rate monitor going off. Imagine pumping every 2 hours because you know breast milk is the best thing for your baby. Imagine the feeling of hopelessness when your baby will not eat. Imagine having to feed your baby through a feeding tube. Imagine trying to stay sane while all this has taken place. Imagine having a micro preemie. I cannot imagine. Can you? But for the very reasons that Jill talks about here, we have joined Team John in the March of Dimes March For Babies walk every year for the last five years. This weekend will mark another year of helping to raise money for the more than half a million babies born too soon each year. The money we raise supports programs in our community that help moms have healthy, full-term pregnancies. And it funds research to find answers to the problems that threaten our babies. These walks have been going on since 1970 and have raised an incredible $2 billion to benefit all babies. We have so much fun every year and our team has gotten so big. We all wear matching green Team John shirts and the kids and adults alike have a total blast!! I always look forward to this day. If you want to help support the March of Dimes and help save babies, you can Donate to Team John! What an amazing story of inspiration – thank you for sharing your boy with us, Jill. Wow, what pictures, what a story, and what a poem, too. I loved seeing all the photos and John’s growth and progress over the years. What a cutie, he is! I don’t think any of us can imagine what John’s mom, the rest of John’s family, and John himself have gone through. I do know that all the predictions in the world cannot stack up against the human spirit and desire to thrive! Best of luck on this walk and your fundraising efforts to all! It looks like the amount that you have raised to date for March of Dimes has been incredible, so I’m sure this walk will be just as great. Thanks so much for sharing this post, Kim, and thank you, Jill, for being willing to share your John with us! Wow, he’s wonderful! What a beautiful (and inspiring) family. Best of luck reaching goal! What a beautiful story! That was amazing. It just shows what happens when you have determination. It was so neat to see those pictures of John and how is has grown and thrived. You are amazing parents with amazing children. Thank you so much for sharing your story. I need to go find my tissues. Oh my goodness, I was in tears before I even got to the poem! What a moving story and what a difference they are making. Seriously, I can’t imagine. Thanks for sharing this Jill and Kim. Kim, this is so wonderfully written. It brought me to tears and I know how the story goes. LOL! Thank you for continuing on this journey with us and for loving, supporting and praying for us every step of the way. You are one in a million and I am blessed to have you as my friend. Thank you for all the sweet comments too. He is my inspiration! What a lovely and inspirational story. What an inspiring story. What an amazing young man and family. What amazing strength these people have. My SIL has had 2 children born early, 1st one 13 weeks early, and he has grown up fine and healthy, 2nd one born 16 weeks early, he has grown into a remarkable boy, but he does have high functioning autism. Both of my nephews are wonderful and we love them dearly and many times we held our breath as they overcame obstacles, especially the first 6 months they had spent in hospital. John must have a very strong spirit to overcome so many obstacles the way he has, and wonderful, dedicated, loving, determined parents. My own 2nd son only lived for 11 hours, but he was full term, but I had prolapsed cord. So that poem was so heart wrenching, but so well articulated. I wish you all the best in your walk and fundraising efforts. Such a beautiful and inspirational story. Thank you both for sharing it with us. This little man is a true fighter and obviously has the perfect parents xoxo Wishing your team a lovely walk. John is a miracle but so are his parents! What an inspiring story. I am so impressed with their commitment, energy and heart. In every photo they have a smile that they’ve obviously passed to John. You are a sweet friend for sharing the story with all of us. My daughter screamed and cried from the moment she was born. I had nursed 5 other children, but she wouldn’t nurse. I went for every help I could get. She was allergic to soy anddairy so formula still made her sick. She threw up all the time. I had to go to a conference for work and was gone for 3 days. Imagine getting off the plane, seeing your husband at the end of the terminal, he hugs you and says, “we lost Katie,” and he starts crying. My mother whos first son wad struck by a car and killed at 2 yrs old found my daughter dead in bed. The worst 2 hr drive home, and the incredibly terrible guilt and helplessness we all felt leaving the hospital while my dead daughter laid on the hospital bed. I feel for that mother. It takes part of your life away when this kind of thing happens. Makes you enjoy every moment. Thank you for sharing this heart-warming story, he is an incredible fighter isn’t he! I hope he continues long his journey through life a strong, courageous soul with the wind at his back and full of life. I was a preemie 56 years ago, 3 lbs 4oz, in an incubator for 6 weeks, no technology then like there is now. I pray that John will become the star he’s meant to be! It truly is a gift … all that our children can teach us and how they shape us. Just look at that amazing and beautiful young boy! Thank you EVERYONE for your sweet sweet words! I know John’s family appreciates your encouragement more than you know. Jill, John’s Mom, is so touched by everyones sweet messages and outpouring of support! They are an amazing family and I feel very lucky to call them our friends! Kim, thank you so much for sharing John’s story. I read this post after you first posted it, but I was too emotional to leave a comment! I’m feeling more collected today, but I still have goosebumps after reading Jill’s poem again. I cannot imagine what Jill went through as a mom, it takes my breath away just thinking about it. I often think about little ones like John, and it seems to me that God has a way of gifting them to the perfect set of parents. I hope you all have a wonderful walk! What a miracle – thank you so much for sharing John and his family’s amazing journey and their beautiful montage. It brought tears to my eyes as I can relate to their experience in many ways. My twins were born premature 11 weeks and spent 10 weeks in the hospital. I remember how scary each day was, the roller coaster of emotions, not knowing if they would have any long term issues. We are so blessed that both my boys are healthy teenagers today, and they are that much more precious after all they went through as infants.